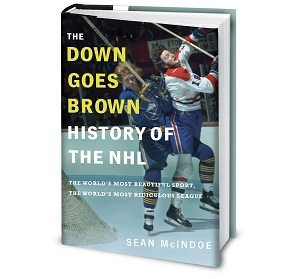 Down Goes Brown: Is Alexander Ovechkin a coach killer? The struggling Washington Capitals fired head coach Bruce Boudreau last week. And while Boudreau landed on his feet almost immediately in Anaheim, there are still plenty of questions about what went wrong in Washington. Most of the fingers are pointing at franchise player Alexander Ovechkin, who's numbers have dropped significantly over the past two seasons. Is Ovechkin hurt? Has he already peaked? Or, perhaps worst of all, did he quit on his coach in an attempt to get him fired? As it turns out, that last question came up recently at one of new coach Dale Hunter's first practices in Washington. And Bloge Salming was there with cameras rolling. You can download an mp3 of this song at Backhand Shelf. But we're lookin' for a Cup, have you seen it? Leonsis promised we'd hang banners in the arena. And now the coach tells me that he thinks I don't play hard? And not choke against the Pens, or some hot goalie again. Cause you're not going to budge me. And with ten years left to go they found I didn't care? Ummm...ducks still haven't won under boudreau. Caps have won with Hunter. Can somebody tell me what song this is a parody of? Yo that was straight dope. Keep doing what you're doing. Anon- that was Gold Digger by Kanye West. that was great as always keep up the good work! That. Was. Incredible. Outstanding work -- really funny. I too was hoping for a Body Count parody. And maybe a Dale Hunter cross check to someone's head. As an OHL non-London fan--PLEASE STAY IN DC, DALE!!! A lesser man (such as myself) would have had Hunter crosscheck Boudreau into the boards five seconds after the song ended. Not that I'm bitter or anything... I mean who holds a grudge from 1993 until now? Replaced with Mike Keenen, hahahaha. We get it, you know how to use protools. Enough with the rap parodies already, they're awful. Someone had to say it. THE PORTUGAL FLAG ON HUNTER'S BRIEFCASE! It's almost cliche for me to say this but, YOU DON'T HAVE TO WATCH. I already posted in this but I'll post again. This was amazing. Keep doing them. Meh. I used to really enjoy seeing a new Bloge video, but now 80% of them are rap parodies, a music genre I just can't stand. Whatever happened to the Wilson Christmas Parties, the Gong Shows, the Bonding Trips in Huntsville? Those were hilarious without relying on music. LOL great parody of the classic hip hop song. Hmmm, now how about, I aint saying shes a gold GRILLZ digger? Sink your teeth into that one! This is eerily prophetic after Oates has been crucified for the 13/14 season. Ovie (and that contract, because to be fair he wasn't the one who offered that ridiculous sum) and McPhee really are coach killers. Exact same situation in 2014 as in 2011, and no one learned anything from past mistakes.